Dean Foods has a good strategy that could lead to investor rewards, but a different type of dairy company is likely to offer more potential. Dean Foods (NYSE:DF) has seen stock appreciation of just 2.20% over the past year, during a raging bull market. This is often a sign that a company is weakening. 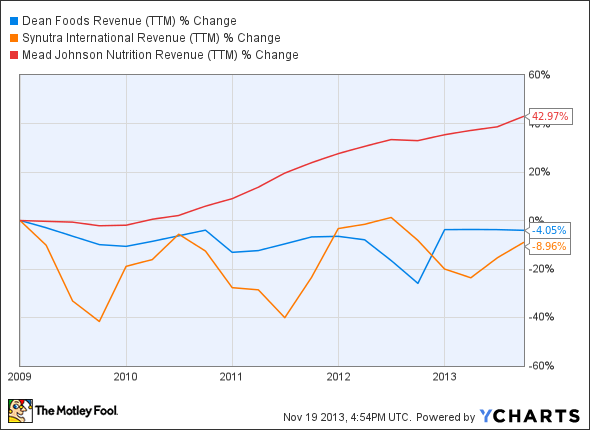 Dean Foods isn't necessarily weakening, but changing. Based on recent events and industry trends, Dean Foods is attempting to become a leaner company, aggressively cutting costs while delivering shareholder returns. While there is room for debate due to reasons mentioned later in this article, Dean Foods isn't likely to be a top investment option in this sector. Fortunately, Syuntra International (NASDAQ:SYUT) and/or Mead Johnson (NYSE:MJN) might offer more investment potential, for one simple reason. 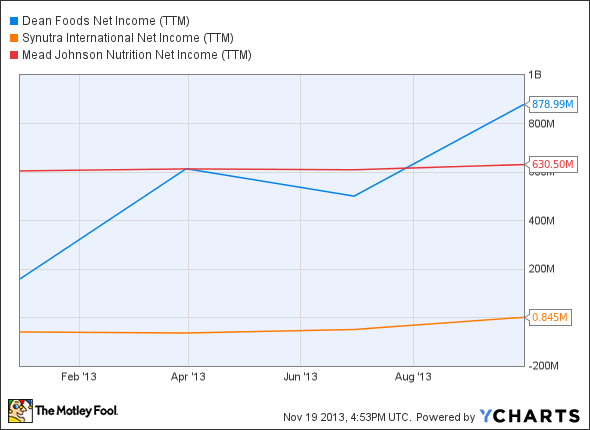 Dean Foods lost a significant long-term contract with Wal-Mart earlier this year, which then led to volume declines. This event, combined with what the company sees as a lack of wage growth and lower birth rates in the United States, has led to Dean Foods focusing more on leanness. This is meant in a major way. Dean Foods has already spun-off WhiteWave Foods and sold Morningstar Foods. It's now focused mostly on fluid milk, which can be found in 90% of U.S. homes and which sees $20 billion in annual sales. Dean Foods has a coast-to-coast processing and distribution network, which leads to greater efficiency than peers, but Dean Foods is still looking to cut costs. For instance, during the first nine months of 2013, Dean Foods closed seven production facilities and announced the closure of another. It expects to close 10%-15% of its plant network through the first half of fiscal year 2014. It will also eliminate distribution routes and reduce SG&A expenses. By cutting costs, Dean Foods will have more available capital to return to shareholders. It recently announced that its board approved a $300 million share buyback, as well as a $0.07 quarterly dividend that will be available in the first quarter of FY 2014. However, Dean Foods sees top-line challenges. While Syuntra International has been the most impressive on the top line over the past year, Mead Johnson has easily been the most consistent over the past five years. Also, Syuntra International only has exposure to China. Mead Johnson is more geographically diversified with exposure to China, Latin America (consistent growth), Europe, and North America. Dean Foods owns many well-known brands, including TruMoo, Garelick Farms, Mayfield, McArthur, Oak Farms, Meadow Gold, Country Fresh, Lehigh Valley Dairy Farms, PET (licensed brand), and more. TruMoo has been an innovative hit for Dean Foods. 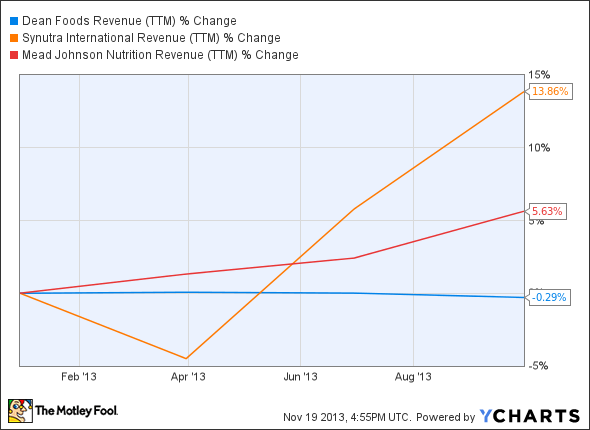 Therefore, Dean Foods will look to innovate off its success in order to help fuel the top line. Plus, Mead Johnson yields 1.60%, whereas Syuntra International doesn't offer any yield. Dean Foods is a company in transition. Expect bottom-line improvements, which will coincide with returned capital to shareholders. For investors, this has the potential to equate to slow and steady returns. However, the companies' weak top line is concerning. Mead Johnson should offer the most long-term potential, thanks to its geographic exposure (including strong exposure to China and its shifting one-child policy). It's consistent on the top and bottom lines, and it yields 1.60%. The industry itself holds promise for investors and as always Foolish investors should do their own research before making any investment decisions.